You must have heard about tumblers that can keep your drinks cool throughout the day? Well, those tumblers are found aplenty, but they are good for that specific purpose – to keep your drink “cool”. But the rocky mountain tumbler amazon is capable of much more, as claimed by the manufacturer. In this post, we will go through the Rocky Mountain Tumbler Review 2019, I hope this will help you to understand more about the product. With the sweltering summer days nearing on, it is time to get those coolers fixed and readied, to enjoy chilled drinks. But if you are always on the move, a cooler is not really going to suit your mobile lifestyle; the most powerful coolers are not even portable! For this situation, a tumbler is the best option for you. What is the Rocky Mountain Tumbler? 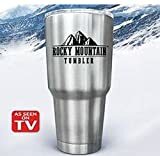 The rocky mountain tumbler as seen on TV is a solid travel mug that is made out of stainless steel. And as per the TV commercial, it appears to be superior to the usual tumblers made out of plastic. The official website of the Rocky Mountain Tumbler is buyrockymountain.com . As per the manufacturer, the Rocky Mountain Tumbler can keep your chilled drinks cold for a solid 24 hours. Moreover, you can also carry hot beverages in it and keep them hot for up to 12 hours. This Rocky Mountain Tumbler comprises a dual wall vacuum structure that takes care of the insulation aspect that helps to maintain the exact temperature of your cold beverages and also keep them fresh all day long. The overall capacity of Rocky Mountain Tumbler is 30 oz. The rocky mountain tumbler amazon is the most suitable for all those who enjoy a refreshing cold drink on a hot summer day. It is especially suitable for those who have to stay outdoors for a very long time, such as construction workers, and sportspersons who train for long hours. It is also good for those who need to travel a lot since the normal tumblers are not effective in keeping their drinks chilled for a very long time. The double layer of the wall creates a vacuum that helps in maintaining the insulation. This helps to keep cold drinks cold and hot beverages hot all throughout the day. Moreover, the tapered bottom of this tumbler makes it a perfect fit for the standard cup/bottle holders too. This tumbler is manufacture with of high-quality stainless steel of 18/8 grade which makes it a very durable product. It is therefore good for daily use. A capacity of 30 ounces is usually sufficient for an individual. So the Rocky Mountain Tumbler comes with ample volume to meet the average needs of a person. The manufacturer asserts about rocky mountain tumbler as seen on TV, that it has been made up using BPA free ingredients and is therefore totally safe for use and non-toxic. There are various reviews available on the Internet that you can look up before buying this product. Many user reviews clearly point out the plus points of this Rocky Mountain Tumbler. Let us first take a look at the various advantages that the Rocky Mountain Tumbler has to offer. • As per many rocky mountain tumbler reviews, this product is a decent one that somewhat lives up to the claims by the manufacturer of rocky mountain tumbler as seen on TV. It is pretty effective for keeping hot beverages hot for nearly 2 hours or so, and unlike the cheaper tumblers available, does not let the drink cool down easily. • Many of the other users have expressed their positivity saying that along with doing its job perfectly, this product is also very easy to carry along and handle, owing to its design and build. • Moreover, with 30oz capacity, you can easily empty a standard bottle of 26oz and also add chunks of ice cubes to it, to maximize the chill factor. The Rocky Mountain Tumbler is excellent in that way, by providing enough volume to keep your hydrated well throughout the day. Just like both sides of a coin, the Rocky Mountain Tumbler failed to impress all of the users. 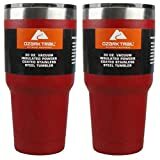 • Several rocky mountain tumbler review has mentioned that the design of the lid of this tumbler is faulty, since it spills liquid into your face and body when you are drinking it. The provision of using a straw would have been a better idea perhaps, to solve this problem. • Moreover, some users also feel that rocky mountain tumbler amazon is not that effective in keeping drinks super hot, as advertised in the TV commercials. The moment you open the lid to take a sip of the drink, the air outside comes into contact, thereby cooling it down. However, it is good for keeping cold drinks cold. 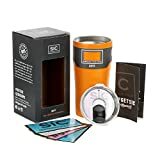 Seriously Ice Cold Insulated Tumbler, Orange, 20oz. NEW & IMPROVED DESIGN - More sleek design to stand out and fit in more cup holders - don't purchase counterfeit product from any other seller as it will not be the new design and will not be real. LIFETIME WARRANTY: We've worked hard to create the best Stainless Steel travel tumbler on the market, which is why we are confident in offering you a lifetime guarantee both for satisfaction and for durability. We know our cups will be ready to go with you wherever you want to take them and if they ever let you down we have your back and will take care of you! MULTIPLE COLORS & SIZES: We have the most diverse product offering on the market with many different powder coated colors and 3 different sizes from 20 ounce, 24 ounce and 30 ounce. Pick which color you want to GET SIC with today! Our cups are designed to fit in to most cup holders with no problems. ENVIRONMENTALLY FRIENDLY - Do your part to help eliminate single use plastic bottles and cups because your SIC Cup will last you a lifetime! It is unbreakable and easy to wash so you can take it with you on any adventure or wherever you choose to Get SIC! Our shatterproof lid features the perfect shaped straw hole so you can fit any straw that you have. VACUUM INSULATED SWEAT FREE FOR COLD & HOT BEVERAGES - You know your drink always tastes best when it is the perfect temperature - either Ice Cold or Piping Hot! Our double wall vacuum insulated cups keep your drinks the exact temperature they should be while preventing any sweating on the outside of the cup. among others, are worth the search, with already many reviews and ratings. the rocky mountain tumbler amazon does let you enjoy the cold drinks cold. The price is reasonable and it definitely performs much better than any normal plastic travel mug too. Moreover, the ample capacity is something that you will genuinely enjoy, without having to break for refills frequently. Overall, the Rocky Mountain Tumbler does seem to be a decent purchase. After reading our Rocky Mountain Tumbler Review article what do you think about this product? whether it is important for you or not. Do share your reviews in our comment section. Stays cold up to 24 hours! Stays hot up to 12 hours! Overall this product gets the positive response from its users. So, if you are true wanderer you can go with this product.